The Armory is a special place for me because it was my first major urban discovery. Although I had seen the building many times driving past it on highway 40 over the years, walking around the massive structure was an entirely new experience. The building is both in use and horribly blighted. Most of the exterior windows are broken and rooms appear to simply be filled with trash, but a peek inside the basement parking area yields luxury cars and lights. In this UrbanSTL thread, ecoabscence says it was being used as parking for Famous Barr employees (in January 2005), but I have been back this year and despite the fact that the Macy’s warehouse next door is closed, the garage continues to have just enough cars in it to let me know that something is going on there. Also, St. Louis Patina has a great piece on the Armory, but many questions remain. Basically, I’m still very curious about the Armory. So much must have happened here, I’m not sure why google hasn’t told me more. I know that a proposed sale of the Armory in 1981 almost led to a fistfight outside of the state legislature. I know that Tennis greats honed their game here and that the Fox Associates got a contract to try to help the Armory expand as a concert venue but I don’t know much else. Luckily this research led to another interesting finding. This particular National Guard Armory is one of many armories we used to have around the city. It is also not unique in its housing of athletics. 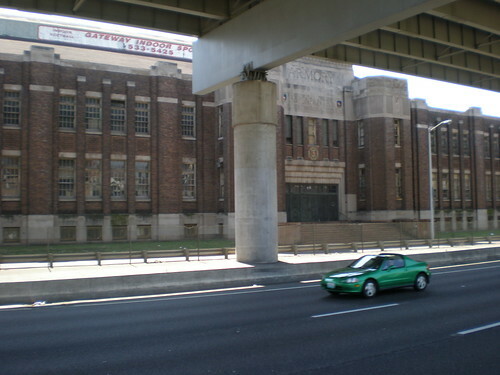 Another Armory (the Battery A), once located close by at 1221 South Grand, was for a short period of time home to the St. Louis Gunners, an NFL team we had in the 1930s. The same Armory also hosted boxing matches during the same time period. I still have lots of questions about the Armory (and the others around the city), and would love to see the inside of it, but I am actually satisfied with the fact that I was able to discover it at all. Maybe there’s still more going on there than it looks like. Next you should check out the Arsenal. It is located to the east of Lyon Park, across Broadway from the brewery. (Lyon Park used to be a part of it, but was given to the city some time after the Civil War.) The Arsenal is still used by the US military. The Arsenal predates the Civil War and was important in keeping Missouri in the Union. Unfortunately it is off limits to civilians, but you can see some of the old buildings from outside the gate. You can also drive east to the levee on the north side of the Arsenal. Look for the pyramids of cannon balls stacked on top of the fence posts. Thanks so much for reading and for the suggestion. I really do need to go to the Arsenal because I know that its buildings are some of the oldest in the city. I appreciate the tip about where to drive around. It even lists the buildings address. Here is a picture of a ticket stub. Look up the St Louis Hinder Club or St Louis Hinder Club Ltd. I think they are the organization that currently occupies the building located at 3676 Market St. The term hinder refers to an action in either a handball or racquetball match. So I would assume they are an athletic organization that takes members. Their phone number is 314-534-8958. Nice work John! I may just have to give them a call and ask what’s up. Thanks for sharing this! I have wondered the same things about the Missouri Armory on Market. I was just out there yesterday walking around the building and went in the garage area, a few cars were parked, lights on in the garage but no doors unlocked or answers to knocks. I would love to see about the use of the building and to restore it! Pretty cool though huh? Not being able to get past the parking area drove me crazy! Hi Linda, Please contact me with any questions regarding the Armory Building. I have been in the Armory since 1982. If you have questions you would lke to have answered, you can contact me. I lived there for over a decade, and currently occupy areas of the building. Unfortunately, I have no control over it’s fate. It is approximately a quarter of a million square feet in size, and is one of the most magnificent buildings in the city of St. Louis. The main gym is larger than two NFL hockey rinks, with a volume of nearly 2,000,000cu.ft. There are two indoor handball courts, and a twenty-five meter pool contained within the structure. It breaks my heart to see it continue to deteriorate because of neglect. I would love to find a developer to help save this treasure. Someone please help. Thank you for the information! This building truly is incredible and needs to be saved. Would you be allowed to tour a few students aroudn the building? I would try emailing him directly if I were you. Would you be allowed to tour a few students around the building? A friend has been trying to locate pictures of the old Battery A Armory on South Grand, which was demolished to make way for the Wohl mental health facility, in the 60s I believe. Can you tell me the source of the picture you’ve posted here — looks like it’s from a publication? I wish I could give you a better answer but I simply pulled it off of a website (the photograph is a link to its source). Contacting the creator of that site may get you further. I was part of Mo. Nat Guard in 1954-55. Went active duty to the Air Force in 1955. I can’t believe the Armory is in such a condition. My outfit was E Co. 2nd Batn. Just a grunt. I remember good times there and I remember the activation and train ride to Jefferson Mo. for duty during the prison riot in ’54. Like you i hope something can be done to restore the armory to it’s military specs, not a bunch of condos or shopping malls. Wow! Thanks for commenting. I am very curious to hear more about the Armory when it was in use! If you would be willing to do a guest post on my blog about Armory memories I would be thrilled to post it. 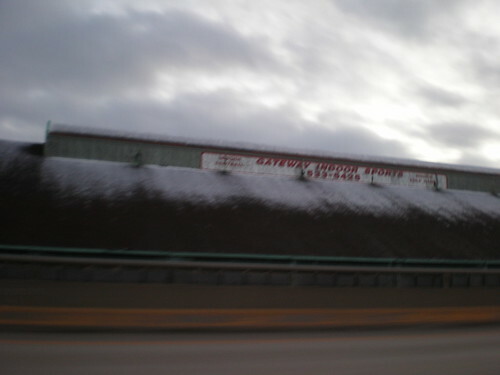 I played winter baseball at the Armory in the early 90s. It was kind of fun but it did get cold in there! I remember they would set up some large industrial heaters behind home plate. Right field was very short and there was a a bar overlooking the field. We were finishing up a tournament there when a big ice storm hit (1990 or 91 maybe?). Awesome! We need to get that place opened back up (and maybe get better heat installed)! I was one of the bartenders at the Armory for baseball games/tournaments. That place is amazing and a lot bigger than I thought. I basically stayed in the enclosed bar area that overlooked the ballfield. I know they had batting cages but I never went down there. There was a small segment on tv – St. Louis something – that showed the bar area and ballfield (I have it if you would like to see it) Great memories at that place. I believe I remember you jennifer, I was also in the show me st louis segment, I was one of the ballplayers that was always there play about every night of the week…lol. I was the one at the end of the segment that handed Dan Buck the Autographed softball. I do research on the history of the 35th Division, including both Kansas and Missouri National Guards. This Armory went into service in 1939 as the HQ of 138th Inf Regiment. It is a beautiful old building. It would be great to see used for its intended purpose again. I use to run in door track and field in the building when I was in high school the years of 1976 – 1980; I went to Northwest High School on Riverview Boulevard. I would love to see the building turned into a sports complex. I am a USA Track and Field Official and this would be an ideal facility for indoor track. I wish I had the funds to get it up and running again. If the city ever one the bid for the Olympics, this would fund it. Just a thought. So what’s going on with it now? Is it still a sports complex? Thanks! Honestly I’m not sure what’s going on here now but I’m pretty sure it’s no longer a sports complex. The building is no longer a sports complex. There are a few tennants, of which I am one, and the owners of the building are hoping to find someone who will utilize the it and develop it. It will be a huge project, but the building truly is a magnificent structure. Thanks for keeping us up to date Frank! A lot of people see the potential in this building but nobody is as dedicated to it as you. As an aside, do you know what’s being built immediately to the south of the Armory? It looks to me like the new Grand Viaduct and Metrolink station might be attracting some new investment to the area. As expressed by many of the other post here, I too have a love for this building, furthered by the fact that my background is in architecture, and I have Masters from Wash U in Architecture, and also Urban Design. I am curious to know more about the building in its current state, and how you have been using it, since the few times I have been by there, it looks completely unoccupied. I would love to have a conversation about the building, for a bit more understanding of where it stands now, in its current state. Let me know if you are interested in discussing. Frank, thank you for the info! St. Louis is a sports-town so I was surprised to hear it was no longer being used for that. Is that type of use out of the question in the future? No, it’s certainly one of the best ways to utilize the building. Besides the 40,000sqft gym, there are handball courts, and a 25 meter, four lane Olympic pool in the building. I’ve been in the building for three decades, and always hoped to make loft apartments, or a gated community in the building. It would be the perfect use for the building, but may be too ambitious to be realistically feasable in these tough financial times. Not sure if this website is kept up to date still, but curiousity got the best of me. I played varsity baseball at SLUH from 2003-2007, and our team would practice here when the weather didn’t agree. I was thinking about taking some pictures of the exterior to give as a gift to my high school baseball coach who was a great influence on me. It was pretty cold for the most part and the astroturf was incredibly hard. Fielding ground balls was a bit scary and there was a net over the seats, so pop flys from the coaches were more like line drives. Occasionally baseballs would go into the seats through the net and whatnot so we would have to venture upstairs. There was a bar with empty bottles still sitting there and definitely evidence of bums living in there. The place was a dump haha. Once, we opened a room where we heard some noises up by the stands and about 100 birds started flying around like crazy. Another time, my teammates got into an argument over sharing a water bottle, which was eventually thrown up through the window of where the snack stand was. After practice when we went to go get it, the water bottle was sitting on the table upright. Creepy place, but I am so glad that I got to experience it and enjoy any piece of St. Louis history. We parked in the garage and had to have a key to open up the stairs to the field and batting cages. There was a racquetball club if I remember correctly that was quite popular because there were always plenty of cars parked in the garage where the team also parked. We weren’t allowed to take their spots because they were paying members. Great memories! Thanks for sharing! I wish I could have seen the interior while it was still in use. I worked in the bar area. I have a tape if you want to see it? Needless to say, we won no precision drill awards. Use 2 play indoor softball there as well….was owned bxw john and christine palliser at the time…great people! Also got 2 help out workin Rave parties, dances, and football leagues. Got to present a signed softball to Dan Buck when he did a story of the place for Show Me St. Louis…..Had alot of great times and met alot of great friends there. I was a bartender there. Often had driven past it in either direction on 40/64 and often would only hear around 12:30am some birds nesting upon it. It has always brought me interest with the architecture and history yet is still in decline as evident with the broken windows and negligence. I surely hope this structure can be resurrected as part of St. Louis history. Perhaps the saddest part is it being kicked aside with the overpass of 40/64 with the Market Street exit as the only closest reminder of how to get to it. Does anyone have contact information for use of this facility?